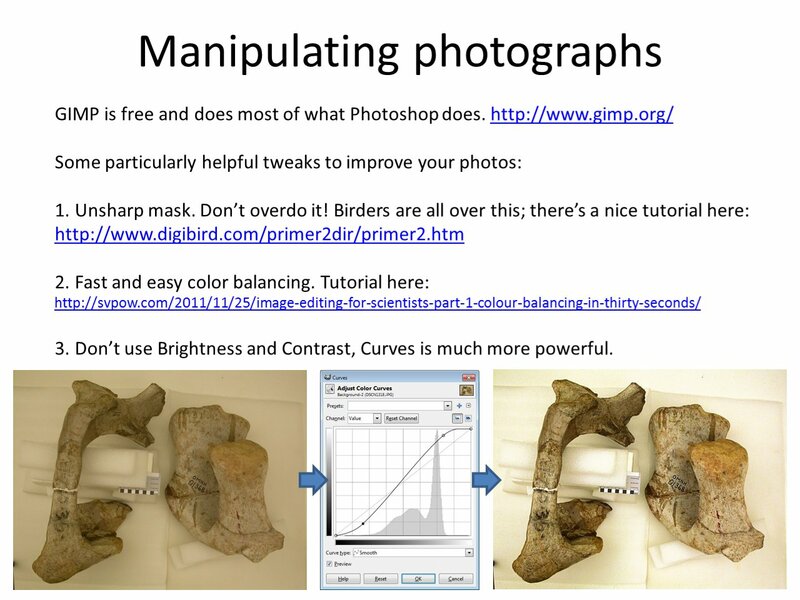 Mike’s post on desaturating the background in specimen photos is here, and previous posts in this series are here. Am I all alone in liking the pictures with the background intact best? What’s fossil and what’s background is a judgment call unless you have the fossil right there and notice the ambiguity. Well, Nathan, the call on what’s fossil and what’s background is much easier to make for the person observing the actual fossil than for someone with only a photograph to go on. So it makes sense for that person to help the subsequent viewer out by de-emphasising that background. What’s fossil and what’s background is a judgment call unless you have the fossil right there and notice the ambiguity. I’m sorry, I don’t follow. For the person taking the photograph, there should be no ambiguity–they have first-hand access, and hopefully they’re taking the offset photographs as discussed here. So if the author/photographer/figure preparer doesn’t do something to separate the specimen from the background, they’re withholding knowledge they have and passing on ambiguity to the reader. Where’s the advantage in that? Without taking sides, I’d say that there is a bit of an artificial presentation when you present an image like the right side above in slides 2 and 3 where removal of the background occurs. 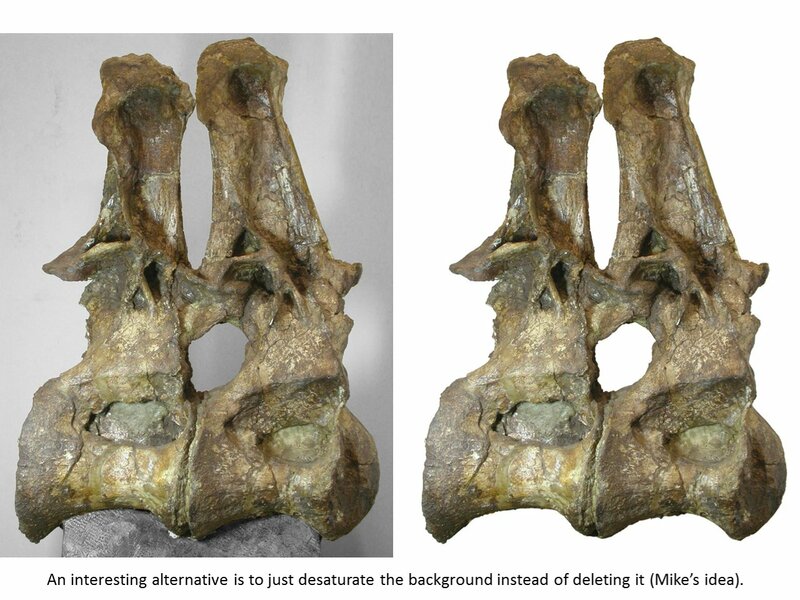 Such occurs with digital removal, and this is a deliberately false, if reasonable approximation of the actual fossil. Its purpose is (almost certainly solely) about “cleaning the image up,” but it doesn’t convey any extra information, merely removing “clutter”: The eye now need not try to redact the background artificially. But there’s a problem with this: while you’re not adding info, you’re removing potential information in the pixels which you’re taking away in your artificial editing of the image. In some types of images, this can be very bad: histological information can be removed by “removing” the background, which often consists of the gel the object being sliced is embedded in, and fragments of the object you’re slicing with it. It’s not worth the hassle of trying to edit around the sectioned object’s periphery. Anyways, that was my 2 … 10 … carry the ha’penny … eh, a lot of pence. I had assumed that this kind of image processing happens in your office, with the (enormous, if it’s any good) fossil not physically in front of you, and maybe months later. Either way, if the process is at all automated, by definition you aren’t applying your full professional judgment to each pixel, and the idiot machine will certainly choose differently than you would, sometimes. Aside from issues of technically accurate pixel representation, the human perceptual apparatus is famously quirky. If the goal is to reconstruct in the reader’s mind a model that represents accurately the physical fossil, the pixels presented to that byzantine perceptual process must be chosen so as not to introduce artifacts. Extreme contrast at the edges cannot help but introduce such artifacts, however difficult it may be to pick out physical pixels responsible for them. Historically, it think this must be a reason why fossils are normally mounted on or photographed against neutral, and not blinding-white backgrounds. I had assumed that this kind of image processing happens in your office, with the (enormous, if it’s any good) fossil not physically in front of you, and maybe months later. It does. That’s why you take the oblique shots in addition to the head-on ones. This isn’t like trying to spot snipers in full camo gear against a backdrop of jungle. I’ve never seen a big fossil so complex that a head-on shot plus a couple more from either side would fail to clearly pick up the edges. Either way, if the process is at all automated, by definition you aren’t applying your full professional judgment to each pixel, and the idiot machine will certainly choose differently than you would, sometimes. I automate as little as possible, for that very reason. 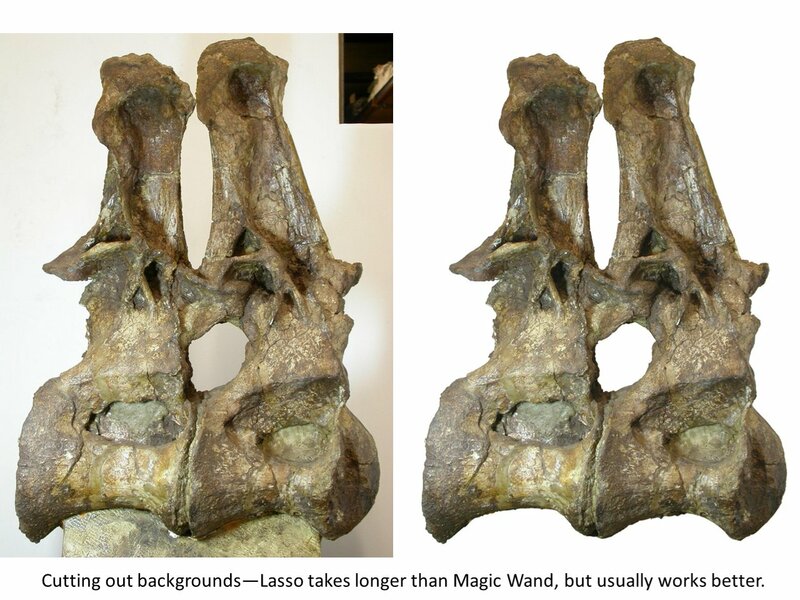 As I said in the second slide, Lasso, which requires the user to pick the boundary points, works better than Magic Wand, where the software just grabs a bunch of points within a certain user-defined color range. I have no idea what point you’re trying to make here. If you just mean that the edges are hard to find, then I’ll just refer you back to the first point I made above. Let’s consider something. In slide #2, the vertebrae sit upon (what I presume to be) plaster bases. These plaster bases are not flat on their dorsal surfaces, as they must be curved to “cradle” the vertebrae. Because of this, and of the angle at which the photo is taken, the plaster base covers some not always-insubstantial amount of centrum. When you redact the base, you remove it, but do not interpolate the centrum within. As such, what you present is a very much false image of the curvature of the ventral magrin of the centrum in lateral view, and that can have some implications in “how spool-shaped?” is the centrum (in lateral view). Amongst other problems. Jaime, that’s pretty much the exact point I made in the original background-desaturation post. I am painfully aware of my marginal presence here. Still, this seems to me a point worth explaining clearly. I’m encouraged that Mike, in the post he references immediately above, touches on similar ground. I hope I can avoid belaboring the point, and crave forgiveness if I fail either way. We are occasionally reminded that the human visual system is subject to a bewildering variety of illusions. Most of the history of representational art amounts to progress in learning to produce just such illusions, to the purpose of making traces of pigment on a surface evoke three-dimensional form, texture, and even captured motion and emotional tension. Most of this progress has been in artists’ technique. Some has been in training viewers to interpret certain graphical conventions symbolically; stippling, for example. Some individual invented stippling. Each of us, as a child, discovers its meaning anew, and then forgets that it was something that had to be learned. It’s almost miraculous that it can seem normal. We present images of fossils in a publication to evoke those same visual illusions. Here, it is in service of communicating the experience of examining the actual fossil. Each dot of color or its absence in the image can either support or interfere with evoking that illusion. (Often it’s necessarily some of both.) I only meant to suggest that a too-sharp contrast between toned fossil and glaring white background steals the reader’s attention, and evokes perceptual experiences foreign those of a person who views the actual fossil. A less-saturated background cannot, by itself, inform, but it can free up the reader’s limited attention for the details that matter most. When we say that one presentation “looks better” than another, we mean that it produces an illusion that seems closer to the welcome parts of the true experience. Thanks, Nathan, that makes sense.